All garage doors require springs to allow them to move smoothly and to counter balance their weight. There are two types that are commonly used today, and both are just as essential and liable to wear out over time. A broken spring will put your door out of operation until it’s replaced, and carrying out the necessary repairs can be complex and also very dangerous. That's why you should choose to let trained professionals like our technicians handle things and not risk trying to DIY. 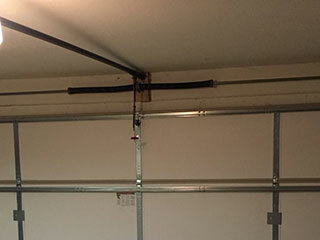 The type of garage door springs you have will determine how often replacement will be required. Although they're installed in a pair, extension springs won't last as long as their counter parts, due to the fact that they aren't as strong. A single torsion spring will likely be stronger, and won't be as dangerous as it will be less likely to whip around when it breaks. However, some door types will one over the other, as will some headroom or backroom limitations. These units should be checked periodically for signs of wear and tear. A good way to do so is to open the door halfway after you disconnect it from the opener. If the door is unable to stay in place and continues moving up or drops back down significantly, then tension adjustments are in order. Excessive squeaking noises while the door is in motion is another telltale sign that some spring maintenance is probably required. Lubrication should be done on a regular basis, to promote a smoother and quieter performance. While you can perform visual inspections and lubricate these units on your own, doing anything more than that is not advised. The tension involve makes any adjustment or spring repair attempts dangerous if you don't possess the required skills and experience. Get in touch with our team at Garage Door Repair West Saint Paul and have our experts help you with whatever you need. We offer emergency spring replacement services as well as scheduled maintenance appointments.